The old favourite ! 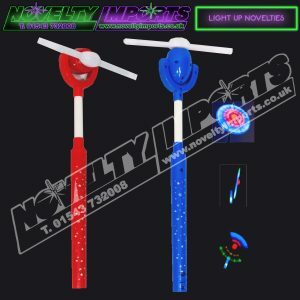 Great for sporting/olympic events, a huge seller at concerts and festival. 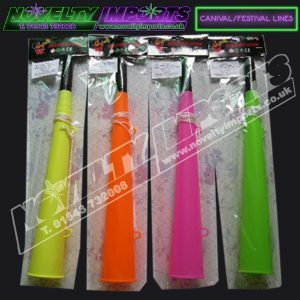 A good quality loud metal whistle on a multi coloured cord now comes with safety breaker for UK standards. Packing 1/pc sealed bag 50/pc inner carton and 1000/pc to a full carton. Becoming more and more popular at big carnival events, this is the 3 tone Tri samba carnnival whistle in Rasta Jamaican coloured lace with safety necklace breaker. Hard to find and expensive in the UK a new exclusive line for this year. 100 & 50/pc sealed bag packing and 600/pc to a full carton. A novelty that has never gone out of fashion, over 5ft in length end to end, the wiggly pet’s worm is a true carnival and seaside favourite. Made in the UK 50 & 100/pc mixed vibrant colours to a bag. Best quality around and can be blown up to a huge 24 inch approx diameter in NEW bright yellow with a smiley face. Add rice inside for extra noise. Punch balloons are NOT suitable for children under 8yrs. Packing 50/100pc bag 500/pc to a full carton. Super Quality CE Approved and safety tested with warning details on each balloon these vivid bright neon coloured latex pearlised punch balloons blow up to a big 32cm (approx) in size. 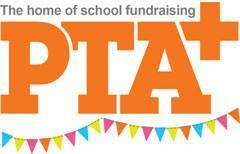 A must for school PTA Charity Fundraising and carnival/festival events 60/pc in each colourful display box and a total of 240/pc to a carton. 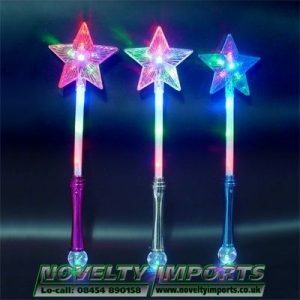 Very popular due to the Frozen film franchise and merchandise. These blue icicle snowflake punch balloons will delight children as gifts or bring in good fundraising potential over holiday periods. Tested to very high safety standards in a counter display box of 60/pc and 240/pc carton. LTD Stock. As featured as a hot seller on BBC Apprentice and amazing as prize eveytime or for school and charity fundraising or holiday gift shops and market grafters. No feeding, No cleaning up & No walking ! RESULT 🙂 The animal walking pet balloon will delight children and adults alike. Cleverly designed with weighted cardboard feet, these animals give the effect of walking on air. Just fill with Helium from any florist or party shop add the ribbon and there you have an instant walking pull along baloon pet. All designs come flat packed and will include a mix from our range that may include Dinosaur, Dog, Horse, Frog, Panda, Bunny, Cat, Elephant,Lady Bird, Zebra, Penguin and more. 50/pc and 100pc to a carton. A pack of 30 emergancy rain ponchos, ideal fast selling line if the weather changes. 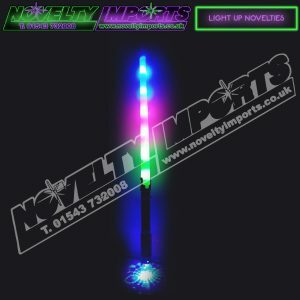 Great for festivals, concerts, markets and outdoor events. Good profit potential on these. 30/pc mixed colours.